This image from a NASA meteor camera shows a stunning fireball light up jsut as a Russian rocket stage soars overhead (bright dot at upper right) on Sept. 30. 2011. A camera at NASA's Marshall Space Flight Center in Huntsville, Ala., recorded the view. The space light show occurred Friday (Sept. 30) over NASA's Marshall Space Flight Center in Huntsville, Ala., at about 8:37 p.m. EDT (0037 GMT). A wide-field meteor camera, one of many in a network NASA uses to track fireballs, recorded the "spectacular meteor breaking up in Earth's atmosphere," according to a blog post by meteor scientist Bill Cooke,head of NASA's Meteoroid Environments Office at the Marshall center. "Also visible is a star-like object moving slowly toward the upper middle of the field of view — the upper stage of the Zenit booster that launched the Russian Cosmos 2219 intelligence satellite back in 1992," Cooke wrote. "Orbiting 500 miles above Earth, this empty rocket body can get bright enough to be seen with the unaided eye." In the video, the rocket body appears as a tiny dot of light near the top of the field of view, drifting to the upper right. 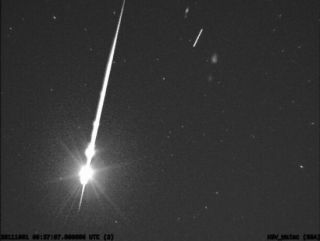 The meteor, meanwhile, streaks down across the left side of the frame in a dazzling fireball. The entire event lasts just four seconds. Seeing a satellite sail across the sky is not uncommon. Many satellites can be seen with the unaided eye for skywatchers who know when and where to look. The largest and brightest is the International Space Station, which can sometimes rival the planet Venus in brightness. The fireball and space junk sighting occurred about a week ahead of the annual October Draconid meteor shower, which is expected to unleash a potential meteor storm this weekend when it peaks on Saturday (Oct. 8). Cooke did not specify in his post if the fireball caught on Sept. 30 was a rogue space rock or an early Draconid display. This year, the peak of the Draconid meteor shower will not be visible from the United States because it will occur primarily during the daylight hours. Skywatchers in the Eastern Hemisphere are better placed to see the meteor shower, though the nearly full moon could wash out the cosmic fireworks, NASA scientists have said. Editor's note: If you snap amazing Draconid meteor photos you'd like to share for a possible story or image gallery on SPACE.com, please contact managing editor Tariq Malik at tmalik@space.com.